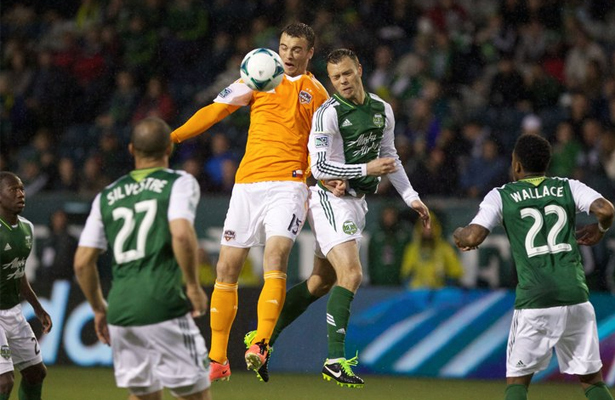 The Portland Timbers travel to Texas to play the Houston Dynamo next Saturday. Dominic Kinnear has been the Dynamos head coach since the franchise relocated from San Jose. In that period, he’s won two MLS Cups, lost another two finals, won the east and west conferences five times. Arguably, the Dynamo are the most successful MLS team, considering their relative youth. Each year Dom Kinnear assembles a pool of mid-of-the-road talent, mixed with a couple of talented game breakers, and puts together a team that will be competitive to the last. Toward the end of last season, Houston traded Scottish Midfielder Adam Moffat to Seattle and received an inexperienced Midfielder in return. It was a puzzling move at the time, and ultimately, the lack of a defensive midfielder cost them in the playoffs against Kansas City. Moffat is now in Dallas after being traded by Seattle for ex-Timber Kenny Cooper. Moffat must be scratching his head wondering when the wheel will stop spinning. Veteran forward Brian Ching retired at the end of last season, but he didn’t provide much last season and won’t be missed. Defender Bobby Boswell was out of contract and was picked up by DC United. Former Timber Mike Chabala had his option declined. The Dynamo announced that they have formed an affiliate partnership with the Pittsburgh Riverhounds of the USL PRO for 2014. They shipped a host of players there during the offseason, so it really seems that 2014 will be a rebuilding year for the Texans. In came David Horst from Portland, and young midfielder Tony Cascio on loan from Colorado. The product of the RSL academy, Cascio was deemed surplus to requirements by Pablo Mastroeni. So far this season, Cascio has played serious minutes and will be expecting to own the offensive midfield position for Houston when the world cup comes around. Brad Davis, Ricardo Clark & Boniek García ran the midfield to great effect last year. If they can keep up their form, then Houston will do well. Great work rate, and the skill to boot mean that it’s tough for any team to get change from the Houston midfield. Forwards Will Bruin & Giles Barnes are switching their roles from last year. Bruin couldn’t buy a goal while Barnes had a career year. This year, Barnes has yet to score, while Bruin is scoring every two games. Omar Cummings, has been given a super-sub roll since arriving from Colorado. He will be looking to add late goals and pin back defenses. Unfortunately for Houston, they are currently more than three hundred and sixty minutes without a goal. Brad Davis has been injured and hasn’t appeared for the team since the first game in April. There are rumours that Davis will return against Portland. If Davis is out, the Timbers must take advantage and dominate the midfield possession. At the back, Tally Hall is one of the most consistent shot stoppers that this league has seen. Corey Ashe has great pace out-wide, and Kofi Sarkodie is the boss of the defense. He did get sent of last weekend, however he will be back for the Timbers game as Houston play New York midweek. Houston have had a couple of red cards so far this season, and more than a handful of yellows. Disciplin seems to be an issue. Depending on how Wednesday goes for Houston, the Timbers will hardly have a better shot at beating the Dynamo in Texas. A three day turn around, after a long trip to the east coast. Houston will be smart on & off the ball. They’ll invite the Timbers defense out of position, then play wide, fast breaking football. They probably won’t get much change out of the midfield, so look for the Timbers to target the defense with long passes to the wide attacking channels. The Timbers fullbacks will have a busy day, if they are to shut down the Houston attack. The Dynamo have collected just seven points from six games this season, and have scored seven goals, while conceding 12. However, 4 of those were conceded against Dallas after David Horst was sent off. (Another 4 came Wednesday night against New York). The defensive unit in Houston is decent, and the offense is starting the click, but the goal production by the midfield is not up to the Dynamos usual standards… yet. The time is right for the Timbers, but it won’t be easy.